On 12 October, 2016 a measles outbreak was reported in Mayuge District, eastern Uganda. We investigated the outbreak to determine its scope, identify risk factors for transmission, evaluate vaccination coverage and vaccine effectiveness, and recommend evidence-based control measures. We defined a probable case as onset of fever (≥3 days) and generalized rash, plus ≥1 of the following: conjunctivitis, cough, and/or runny nose in a Mayuge District resident. A confirmed case was a probable case with measles-specific IgM (+) not explained by vaccination. We reviewed medical records and conducted active community case-finding. In a case-control investigation involving probable case-persons and controls matched by age and village, we evaluated risk factors for transmission for both cases and controls during the case-person’s likely exposure period (i.e., 7–21 days prior to rash onset). We estimated vaccine effectiveness (VE) using the formula: VE ≈ (1-ORprotective) × 100. We calculated vaccination coverage using the percentage of controls vaccinated. We identified 62 probable case-persons (attack rate [AR] = 4.0/10,000), including 3 confirmed. Of all age groups, children < 5 years were the most affected (AR = 14/10,000). The epidemic curve showed a propagated outbreak. Thirty-two percent (13/41) of case-persons and 13% (21/161) of control-persons visited water-collection sites (by themselves or with parents) during the case-persons’ likely exposure period (ORM-H = 5.0; 95% CI = 1.5–17). Among children aged 9–59 months, the effectiveness of the single-dose measles vaccine was 75% (95% CI = 25–92); vaccination coverage was 68% (95% CI = 61–76). Low vaccine effectiveness, inadequate vaccination coverage and congregation at water collection points facilitated measles transmission in this outbreak. We recommended increasing measles vaccination coverage and restriction of children with signs and symptoms of measles from accessing public gatherings. Measles is a highly contagious infectious disease  that spreads efficiently from person to person via the respiratory route , including airborne transmission . It is one of the top five causes of vaccine preventable morbidity and mortality in the world . The incubation period from exposure to fever varies from 7 to 21 days and from exposure to rash usually about 14 days [1, 5–7]. Due to the availability of a highly effective and low-cost vaccine and the fact that the disease does not have non-human reservoirs, measles has been targeted for elimination and eventual eradication . Rapid detection of public health threats such as outbreaks of measles, and control of such threats at their source, are essential for global health security. Uganda began to implement routine measles vaccination in the early 1980’s through static clinics at health facilities and outreach posts in the community. Supplemental measles mass vaccination has also been provided routinely every 3 years since 2003. Measles surveillance in Uganda is part of the National Integrated Disease Surveillance and Response System, which requires immediate notification whenever a suspected measles case is identified [8, 9]. When a measles case is suspected, a case investigation form is completed and blood samples are collected and submitted to the Uganda Virus Research Institute (UVRI) for testing . In October 2016, a suspected measles outbreak occurred in Mayuge District, eastern Uganda. Of the 10 blood samples collected from suspected case-persons, three tested positive for measles IgM antibodies at UVRI. The Uganda Ministry of Health (MoH) declared a measles outbreak in the District. 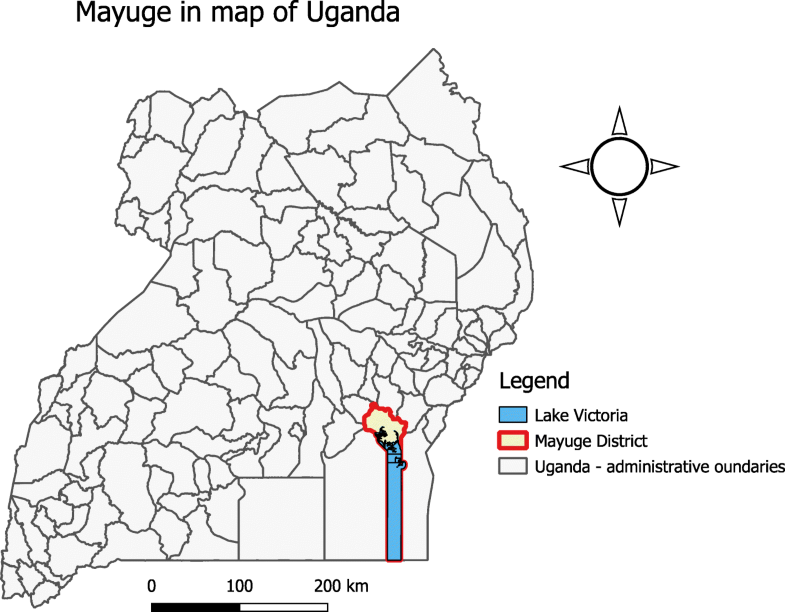 Mayuge District (0°27′28.0″N, 33°28′48.0″E) is located in Eastern Uganda. The district is located about 120kms from Kampala, Uganda’s capital. It is bordered by Iganga District to the North, Jinja in the West, Bugiri in the East and Lake Victoria in the South. The District has 13 sub-counties (Fig. 1), and had a total population of 480,079, of which 4.3% (20,643) were children less than 1 year of age . We conducted an investigation to determine the extent of the outbreak, identify risk factors, estimate vaccine effectiveness and vaccination coverage, and recommend evidence-based control measures. We defined a probable case as onset in a resident of Mayuge District of fever and generalized rash with at least one of the following symptoms: coryza, conjunctivitis, or cough, between 19 June and 17 November, 2016. A confirmed case was a probable case with measles IgM (+) in the absence of vaccination in the preceding 2 weeks. We actively searched for case-persons in the community with the help of community leaders, village health team members and health assistants (i.e., a cadre of public health workers at parish level involved in disease surveillance ). We reviewed health facility records at community health centers in the outbreak area. Using a standardized case investigation form, we collected data on case-person’s demographics, clinical information, and exposure history. We assessed the time distribution of measles cases by constructing epidemic curves. We computed measles attack rates by person and place characteristics. In calculating the attack rates, we estimated the Mayuge District population by extrapolating from the 2014 Uganda National Population Census using the district-specific population growth rates . Laboratory confirmation was conducted at the Expanded Program for Immunization Laboratory (EPI Lab) at UVRI, using the recommended World Health Organization (WHO) procedures . We conducted hypothesis-generating interviews of 20 measles case-persons in the parish with the highest attack rate. We asked the case-persons about potential risk factors for measles transmission between 7 and 21 days prior to symptom onset, including visits to health facilities, community playgrounds, and water-collection points; attendance at place of worship, schools, burial events, and ‘village saving group meetings’ (locally referred to as Nigina); and travel history. To test the hypotheses developed during the hypothesis-generating interviews, we conducted a case-control investigation (Additional file 1) in the two affected sub-counties. The case-control study was conducted in children aged 6–59 months because most of the cases were in this age group. We administered the questionnaire to caregivers or guardians since the case-persons were all minors. We selected one case-person per household; for households with more than one case-person, the first to develop a rash was selected for interview. For each case-person, 4 asymptomatic controls were randomly selected among residents of the same village, matched by age (±12 months). We estimated vaccination coverage (VC) using the percent of control-persons vaccinated. Vaccination status was obtained from immunization records obtained from care takers (immunization cards). We also obtained the administrative data on the number of doses of measles vaccines administered reported in the District Health Information Software, version 2 (DHIS2) for Mayuge District during 2016. In estimating the administrative VC, we used the population estimates for Mayuge District provided by the Uganda National Population Census report 2016 .
where RRProtective is the protective relative risk associated with vaccination, which can be approximated by the protective odds ratio,ORProtective, in rare diseases such as measles. We estimated VC and VE in children aged 9–59 months because Uganda’s routine measles vaccination starts at 9 months of age and this outbreak mainly affected children aged ≤59 months. 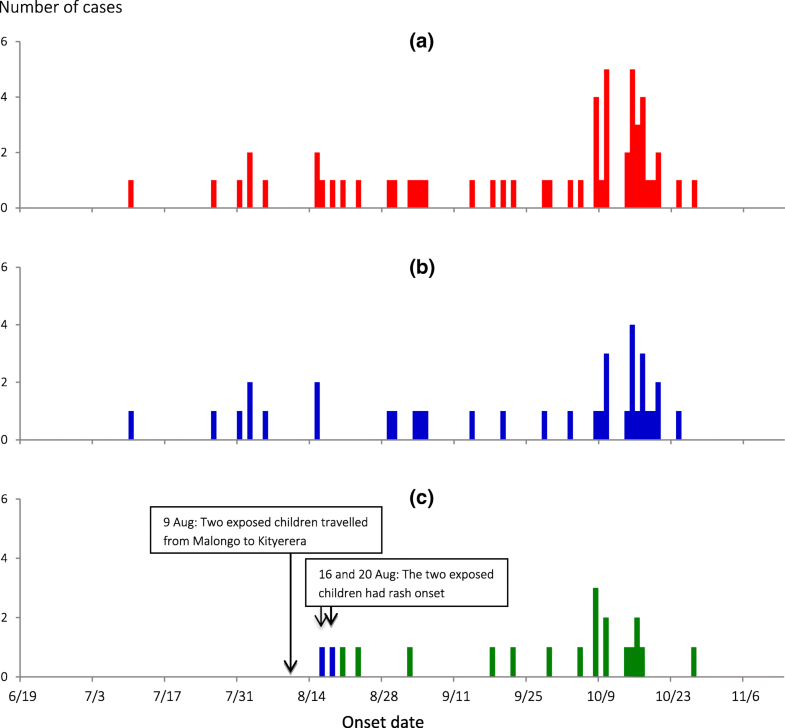 We identified 62 case-persons (overall attack rate [AR] =1.3/10,000), including 3 confirmed by measles-specific IgM. The median age of the case-persons was 35 months (range: 4 months to 50 years). The most affected age groups were 0–11 months (AR = 13/10,000) and 12–59 months (AR = 15/10,000). The attack rate was similar between male (4.3/10,000) and female residents (AR = 3.9/10,000). The outbreak affected 2 sub-counties, Kityerera (AR = 4.1/10,000) and Malongo (AR = 4.0/10,000). The most affected parish was Bumwena (AR = 79/10,000) followed by Kityerera (AR = 13/100,000) (Table 1). None of the case-persons exhibited any complications. The epidemic curve indicated person-to-person transmission (Fig. 2a ). From the symptom onset date of the index case-person (10 July) to that of the last case-person (27 October), the outbreak lasted 110 days. When the epidemic curve was stratified by sub-county, both Malongo Sub-county (Fig. 2b ) and Kityerera Sub-county (Fig. 2c) show propagated outbreaks. The outbreak first started in Malongo Sub-county in July, with several subsequent generation periods. On 9 August, 2 children, aged 24 and 36 months, from a family with suspected measles cases travelled with their mother from Bumwena Parish, Malongo Sub-county to Kityerera Parish, Kityerera Sub-county. On 16 August, 7 days after they arrived in Kityerera Parish, the 36-month-old toddler developed a rash; on 20 August, the younger sibling also developed a rash. Subsequently, a case occurred in the new sub-country, ultimately affecting 18 children. The hypothesis-generating interviews pointed to attendance of social and religious gatherings, school attendance and going to water-collection points as possible risk factors. Among children aged 6–59 months, 32% (10/31) of the case-persons, compared with 13% (16/122) of control-persons, went to water-collection points either alone, with their parents/guardians or with other children (ORMH = 5.0, 95% CI: 1.5–17) (Table 2). No other risk factors examined in the case-control investigation was significantly associated with measles onset. Village health team members reported that in this community mothers with infants < 6 months of age do not go to usually collect water. Mothers who have infants aged 6 months – 2 years tend to carry their babies along as they go to collect water. Children aged > 2 years often go together with their mothers, guardians or other siblings to water-collection points, often carrying age-appropriate water-collection vessels. When the case-control investigation data were analyzed for children aged 9–59 months, 39% (12/31) of case-persons compared to 68% (82/121) of controls had a history of measles vaccination (ORMH = 0.25; 95% CI: 0.12–0.75). Using this information, we estimated that VE = 75% (95% CI: 25–88%) in children aged 9–59 months. Of controls aged 9–59 months, 68% (95% CI: 61–76%) had a history of vaccination; this percentage was the estimated VC. Based on the administrative data, the cumulative (January–September, 2016) measles VC in Mayuge District in September 2016 was 52% against the expected 75% by extrapolation; if no catch-up vaccination had been implemented, VC would have been 69% by December 2016. Our investigation showed that this community measles outbreak was propagated by children congregating at water-collection points. The outbreak lasted 110 days with 62 case-persons. Our investigation demonstrated that the outbreak was transmitted from the Bumwena Parish, Malongo Sub-county to the Kityerera Parish, Kityerera Sub-county by 2 exposed children during their incubation period. Congregation of children at water-collection points facilitated measles transmission within the community, whereas low VC and suboptimal VE increased the susceptibility of the population. Two children who travelled with their mother from Bumwena Parish to Kityerera Parish were the likely source of infection for the outbreak in Kityerera Parish. They had exposure to measles case-persons in the household where they were staying in Bumwena Parish (before they travelled). Since the measles incubation period ranges from 7 to 21 days , the 36-month-old child, who developed a rash 7 days after leaving the family with measles cases in Bumwena Parish, likely had exposure in Bumwena Parish, whereas the 24-month-old child, who developed rash 11 days after leaving Bumwena Parish, likely have contracted measles from his older sibling after arriving in Kityerera Parish. During this outbreak, congregation of children at water-collection points was a strong risk factor for measles infection. In this community, women are the primary caretakers for children; women and children tended to move together to collect water. When they arrive at the water-collection points, the children often spend a lot of time mingling and playing with each other, facilitating the transmission of measles. Congregate settings have been demonstrated to facilitate measles transmission in various settings [13, 14], and hence this explains the importance of discouraging measles susceptible individuals from attending congregate settings that may expose them to measles infection and disease during measles outbreaks. Just like many other Sub-Saharan African countries, Uganda currently administers a one-dose measles containing vaccine given at 9-months as part of the national vaccination schedule . To achieve maximum protection against measles, studies have recommended measles vaccination at 12 months as opposed to 9 months . The measles coverage in Mayuge was estimated at 69%, is much lower than the recommended vaccination coverage of > 90% required for herd immunity and for achieving the measles elimination goal set by WHO for the African Region and adopted by the Uganda MoH to achieve population immunity by WHO for the African Region . Even in countries where good vaccination coverage has been achieved; measles outbreaks still occur as a result of susceptible individuals accumulating over time. The estimated VE from our investigation (75%) was lower than the observed 85–94% in other studies for one-dose measles vaccination . Several factors affect VE, including age at vaccination, and vaccine handling techniques, etc. . In a previous study, the VE for a single-dose measles vaccine administered at 12 months of age was 92%, compared with 85% when the vaccine was given at 9 months . A 2-dose measles vaccine with one given at 9 and the other at about 12 months increased VE to over 94% . During the past 2 years, several measles outbreaks have occurred in Uganda, and the VE has been consistently low (Uganda Public Health Fellowship Program, unpublished data). The reason for the low VE in Uganda is not entire clear, but it can be partially explained by the fact that Uganda’s one-dose vaccination is given at 9 months of age. In the case control study, we used asymptomatic controls, we did not test the controls for measles IgM antibodies, and hence this might have led to misclassification bias for controls. However control persons were carefully selected based on the case definition above. In this study, we used proportion of controls vaccinated to estimate vaccination coverage instead of standard WHO community survey method. It is possible that with this method, we may not have obtained the exact estimate however we triangulated with the administrative coverage, which yielded the same estimate of 68 and 69%. We conclude that exposures to infectious patients at water-collection points propagated this outbreak in Mayuge District. Low VC and poor VE facilitated community transmission of measles in this outbreak. Ministries of Health should consider intensification of vaccination coverage among children less than 5 years for achievement of herd immunity to avoid occurrence of measles outbreaks. Mothers and guardians should be discouraged from taking children with measles like symptoms to public gathering. At our recommendations, the district implemented a vaccination campaign at all health facilities, conducted extra community outreaches and established mobile vaccination teams. All these activities were implemented under the “Periodic Intensified Immunizations” project, with a focus on children 6–59 months. Sensitization of residents to avoid public gatherings when they develop fever or rash was carried out. By November 2016, the outbreak had been brought under control. The authors would like to thank Mayuge District leadership including the District Health Team who spearheaded the district outbreak response efforts, Dr. Mwanje Wilbrod who coordinated the PIRI activities and Dr. Jane Frances Namuganga for her comments and feedback on the draft manuscript. This work was funded by the United States Centers for Disease Control and Prevention under Cooperative Agreement (number GH001353–01) – Provision of Comprehensive HIV/AIDS services and Developing National Capacity to manage HIV/AIDS Programs in the Republic of Uganda under the President’s Emergency Plan for AIDS Relief (grant number 5U2GGH000817–03) through Makerere University School of Public Health to the Uganda Public Health Fellowship Program, Uganda MoH. The funders had no role in study design, data collection and analysis, decision to publish, and or preparation of the manuscript. The data that support the findings of this investigation are available from the corresponding author upon reasonable request. The findings and conclusions in this report are those of the authors and do not necessarily represent the official position of the United States Centers for Disease Control and Prevention, Makerere University School of Public Health, or Uganda MoH. RKM, LN, DK, conceived the study, RKM, LN, DK, ARA, JK, JAA, JKBM, B-PZ participated in planning the study. RMK, LN and DK implemented the study. RKM analyzed the data. RKM, LN, DK, ARA, JK, JAA, JKBM, B-PZ participated in interpretation, synthesis of the findings and drafting of the manuscript. RKM and B-PZ had primary responsibility for final content. All authors read and approved the final manuscript. The Ministry of Health of Uganda gave the directive and approval to investigate this outbreak. In agreement with the International Guidelines for Ethical Review of Epidemiological Studies by the Council for International Organizations of Medical Sciences (1991) and the Office of the Associate Director for Science, CDC/Uganda, determined that this activity was not human subjects research and its primary intent was public health practice or a disease control activity (specifically, epidemic or endemic disease control activity). Verbal informed consent was obtained from the participants before the start of each interview. For children less than 8 years, parental/legal guardian’s verbal informed consent was obtained on their behalf before start of each interview; for minors aged 8–18 years, verbal informed assent and parental/guardian’s informed verbal consent was obtained. For persons above 18 years, verbal informed consent was obtained before start of each interview. Verbal informed consent was obtained because it was impractical to obtained written consent as the affected community was illiterate and this investigation was conducted as part of an emergency outbreak investigation whose primary goal was to generate evidence to inform disease control as opposed to absolute human rights research. All participants were informed about the purpose and nature of the investigation and that their involvement was entirely voluntary; i.e. their refusal to answer any or all of the questions would not result in any negative consequences. Participants identified as patients were referred for free treatment at a nearby health facility. To protect participants’ confidentiality, personal information was de-identified during data analysis, and the interview forms were locked up.